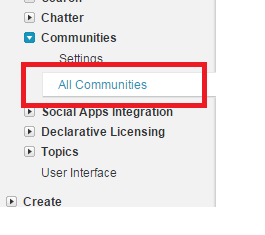 Go to Setup | Customize | Communities | All Communities | Manage Communities. Click on the New Community button. Enter Force MindTelligents for the community name. Enter Community for MindTelligent Clients and Partners for the Description field to describe the purpose of the community. The next step is to enter a URL for the community. This will equate to a subdirectory name underneath the domain prefix entered by you, when you enabled the communities and the Salesforce instance that you are running on. For this example, enter volunteers.